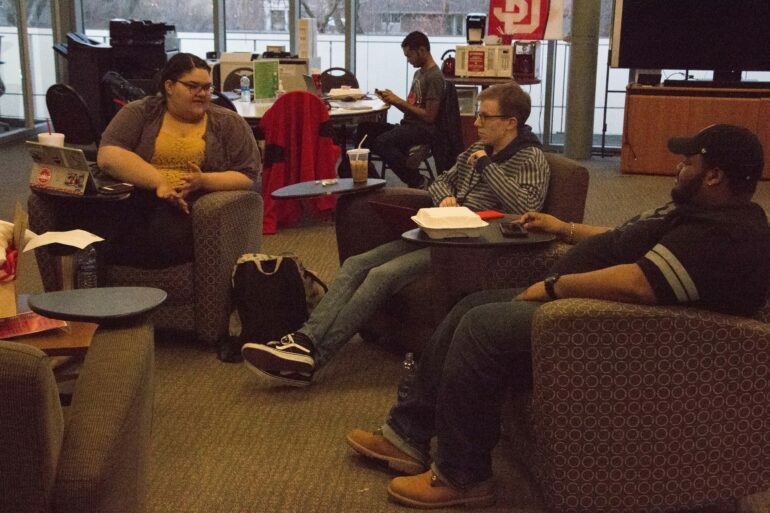 A new student organization is working to promote diversity in student media and in theatre, arts and music. Diversity In Media & Entertainment (DIME) was founded this semester when Micci Abbott, senior sport marketing and media major and creative director of the group, felt compelled to do something about the lack of diversity in certain campus groups. Abbott has been involved with Coyote Radio as the co-host of “Loud & Brown” and the host of her own show “Micci Monday.” She said she noticed that many students didn’t know they could get involved with student media; for example, anyone can host a radio show, write for The Volante or audition for Coyote News without being a media & journalism major. “After ‘Loud & Brown’ started and the feedback we were getting how people were excited about it, how much fun we had working on the radio show and putting it on, I wanted to spread that and make sure that other people had the same opportunity,” Abbott said. Abbott said she’s hoping to partner with the Student Theatre Cooperation, Women in STEM and organizations in the Center for Diversity & Community to bring more diversity to those groups. Abbott wants to encourage members of those groups to join student media and the entertainment fields, too. Abbott said diversity in media and in entertainment is important for representation. Zeimet said one example of the importance of representation in media is the film “Black Panther,” which features the first Marvel film with a predominantly black cast. Sydney Schad, a junior health sciences major and a member of DIME, has a diverse background as an SGA senator, a Tiospaye student council advisor, the secretary for HEAL (Healthcare Executives Advancing in Leadership), a representative for the American Indian Science and Engineering Society and a mentor through the inclusive science initiative at the medical school. Schad said she’s great friends with Abbott and helped her establish DIME, its constitution and funding through SGA. To Schad, diversity is acknowledging differences, but finding a way to work with each population and bring them together as one, she said. Schad said she and Abbott are both passionate about DIME and highlighting the successes of people of diverse backgrounds. “We want to promote things on a positive light to really reflect back on the next generation of children who are going to be in school or going to college,” she said. For those interested in joining DIME, members will be tabling in the MUC with the Cross Media Council each Wednesday at lunchtime. DIME meetings are Tuesdays at 8 p.m. in the CDC.